If you feel a vibration in your pocket next time you walk into a Rexall in Toronto or a Staples in Alberta, don’t worry. It’s just your Air Miles app. Air Miles is piloting its beacon technology that, when you enter a store, sends a message and personalized offers to your smartphone via the Air Miles app – as long as you’ve opted in for location-based services, of course. The pilot, underway now, follows on the loyalty program’s pilot last year with geo-fencing as a longer-range location-based marketing solution. “We’ve been monitoring mobile technology for quite awhile, and we see it as a crucial part of our customer mix today, and into the future,” said Emmie Fukuchi, vice-president of product development at Air Miles. With last year’s geo-fencing pilot, Air Miles delivered messages when a user was from 500 metres to one kilometre away from a store to see how it would impact users, and Fukuchi said the response was good. Now with beacon they’re sending a message to a user when they’re within a few metres of the beacon, generally as they enter the store. “We want to see the customer reaction, how we can deliver value for the consumer and the retailer, and how we can enhance the retail experience for them both,” said Fukuchi. She stresses everything is optional. The customer has to have downloaded the application, and proactively opted into both push notifications and location-based services – and they can opt out at any time. During the test period, when a customer who has opted in walks into a participating Rexall or Staples, they will get a push notification welcoming them to the store and informing them of the offers available. Fukuchi said they’re testing a high fidelity media solution that allows Air Miles to deliver a push notification as a text that, when you click it, delivers calling cards with messages or offers. This person received a special offer via location-based technology — and needs to charge their phone. Air Miles is in the early stages of asking for users to opt in to location-based technology, and has been focused on the geographies where the pilot projects are underway. So far, Fukuchi said about 500,000 people have opted into push notifications, a figure growing at about 20,000 opt-ins per month. She expects those numbers to grow considerably once the service rolls out nationally, and quotes global research that has shown 77 per cent of mobile users are willing to trade location for value. Right now, to make the trade they’ll need to be using an Android or iOS handset. The Air Miles BlackBerry app doesn’t have many users and isn’t being updated, and Fukuchi said they’re waiting to see more traction from Windows Phone. 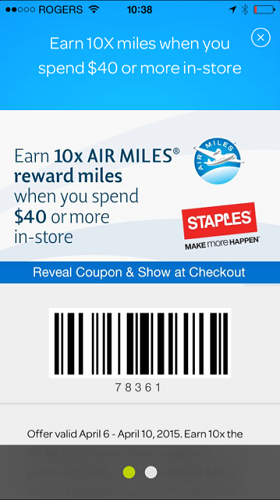 Air Miles is still designing the program around how location-based marketing will be offered to participating retailers behind the pilot phase; right now the focus is on testing infrastructure and learning best practices. One of those best practices, she stressed, is privacy. Air Miles expects to roll out geo-fencing more broadly within the next few months, while the proximity beacon-based piece will come later this year. Retailers will be able to choose which location-based technology they use to reach customers, but users will simply opt in to location-based services – Fukuchi said they won’t have the ability to set the range from store at which they’re willing to revive messages.